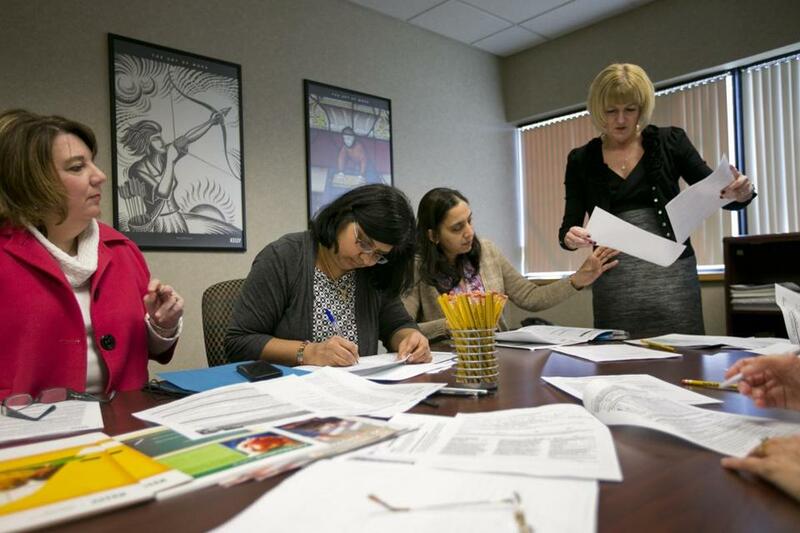 At an orientation for substitute teachers at Kelly Services in Burlington, (from left) area manager Faith Burke helps Divya Lalwani and Kavita Deshmukh, both of Chelmsford, fill out forms, along with Linda Harden, supervisor of educational staffing at Kelly. Early in the morning, before thousands of children arrive at schools throughout Boston’s suburbs, administrators make calls to find hundreds of substitute teachers. Framingham requires 30 to 60 substitute teachers a day to fill absences among its pool of around 800 educators, said Scott. Sometimes he knows ahead of time which teachers will be out — on maternity leave, for example. Others call in sick at the last minute. Either way, telephoning prospective substitutes at the end of the day or in the wee hours of the morning is labor intensive. Administrators usually can’t fill every empty slot, so other staff members wind up covering for their colleagues. Special education teachers who work with disabled children and others add a layer of complexity to the job, too. Officials from at least one school district chose to end outsourcing and resume hiring and managing their substitutes on their own. Others said private companies have helped them tackle a persistent challenge. Because substitute teachers are largely governed by local rules, a comprehensive list of Massachusetts schools that outsource subbing doesn’t exist. The state Department of Elementary and Secondary Education only requires that substitutes in the same position for 90 consecutive days or more hold a teaching license, said spokeswoman Lauren Greene. Chelmsford, Danvers, Marblehead, and Stoneham as well as local private schools use Kelly Educational Staffing to organize their substitutes, said Nicola Soares, vice president of the Michigan-based company. Kelly area manager Faith Burke (right) gave a presentation during an orientation for new substitute teachers. “Not only are we filling classrooms, but hopefully we’re reducing their administrative burden,” said Soares, who said an average of 9 percent of teachers nationwide are absent every day. In December, Framingham sent Kelly and five other companies an invitation to bid on a contract to operate in the town’s schools. Bids are still being reviewed, but Scott, the superintendent, hopes to award a contract in the coming months. Framingham spent around $920,000 on substitute teachers who received $75 a day, and $120 a day during extended placements, in the 2012-2013 academic year, said Ceglowski, the school system’s human resources director. Scott envisioned that most, if not all, of the same substitutes who regularly work in Framingham now would apply and receive jobs with whatever company the district chooses to find fill-ins for absent teachers. Administrative staff who work with them, meanwhile, would be freed up for other duties, he said. Stoneham has used Kelly since 2000 to handle the same hassles that Framingham wants to avoid, said the Stoneham public schools’ finance director, Michelle Cresta. The company uses a Web-based system as well as a call center to arrange substitutes for 760 school districts throughout the country, Soares said. Stoneham requires that Kelly only send subs with at least a bachelor’s degree, said Cresta. The district also runs criminal background checks before accepting a new substitute. Kelly handles recruiting, training, workers compensation, unemployment insurance, and payroll taxes. In the last academic year, Stoneham spent around $170,000 on 12 substitute teachers a day on average to cover for absences among the district’s 227 teachers, Cresta said. The district pays substitutes $60 a day, or $100 a day if they work in the same position for more than 30 days. Kelly’s premium is roughly 40 percent, or $24 for a short-term substitute, in additional to the per diem. The time and energy that’s been freed up has been worth the cost, said Cresta. “It is a very worthwhile, efficient system,” she said. The superintendent of Tewksbury schools, John O’Connor, said Kelly has provided his system with around 40 para-educators for around four years on extended assignments assisting teachers and working with special education students. Taxpayers save around 20 percent of the para-educators’ costs because Kelly picks up their health care, retirement and other benefits, he estimated. A Kelly employee who has been substituting in Marblehead for the past three years, Susan Cool, said the system worked for her. But not every school district has embraced outsourcing substitutes. Schools in Lexington formerly used Kelly as well as a now-defunct company called Opus to place subs, said Robert Harris, Lexington’s assistant superintendent for human resources. Six years ago, however, officials decided they could use the fees they were paying to increase wages — Lexington’s short-term per diem is $90 — purchase their own online system and hire a part-time employee dedicated to overseeing substitutes for less than $20,000 a year. The school district has around 700 teachers, and 21 substitutes on average working every day. Harris wasn’t critical of Kelly or other companies. Lexington simply chose to invest in its own program. The choice gave administrators more control over the education they delivered to students, too. “You are in a better position to deal with the substitutes yourself when you are the employer,” said Harris. Lexington uses Aesop, an online service offered by Pennsylvania-based Frontline Technologies, to schedule as well as compile data about substitute teachers. Around 50 school districts in Massachusetts use Aesop, said Allison Wert, a content marketing specialist for the company. Kelly uses the same system. But Harris and Wert said they saw the benefit of using Kelly or another company to handle subbing if, like Framingham, school administrators were having trouble finding sufficient numbers of good people to fill empty teaching slots. 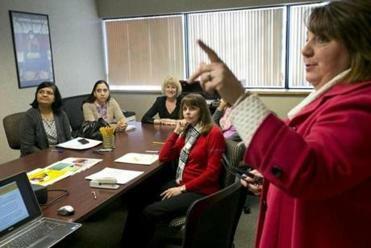 “Some districts just want to hand it off to someone else,” said Wert.